[0:07] Narrator: Since ancient times, volcanoes have been thought of as the realm of the gods. In some stories, explosive volcanic eruptions that sent rock and ash hurtling through the air were divine beings having a fight, and lava was their hot blood spilling on the ground. The word “volcano” comes from two of these ancient deities: Zeus Velchanos, a god of the Greek isle of Crete, and Vulcan, the Roman fire god. And that’s not far from the truth – but a truth based in geology rather than mythology. Volcanoes have been essential in shaping our world. Earth’s land, atmosphere and oceans are, to a great extent, the result of volcanoes. Volcanoes may even have played a vital role in the origin of life. Earth is a dynamic, living planet thanks, in large part, to volcanoes – and did you know we’re not the only place in the solar system that has them? [1:56] Narrator: We’re “On a Mission,” a podcast of NASA’s Jet Propulsion Laboratory. I’m Leslie Mullen, and this season we’ve been following the InSight mission to Mars. Like Earth, Mars has volcanoes. In fact, Mars has the largest volcano in the solar system. Named Olympus Mons – after Mount Olympus in Greece where the gods were said to dwell – this Martian volcano is as wide as the state of Arizona, and more than twice as tall as Mount Everest. But if you were standing at the foot of Olympus Mons, you shouldn’t worry – neither that nor any other volcano on Mars has erupted for millions of years. But why not? That’s one of the questions the InSight mission hopes to answer. Sue Smrekar, deputy principal scientist of the InSight mission, studies volcanoes. [2:43] Sue Smrekar: I had a chance to go to Hawaii and Mt. Etna and to Iceland. So I had a chance to go to several volcanoes over a period of about 10 years. Mt. Etna's a place where they have eruptions where things spew out of the top, and these rock bombs can come hurling out of the volcano to the surrounding area. But I was never there during that kind of eruption. I've never witnessed a super dangerous type of flow. The type of flows that we were studying don't move very quickly. I mean yes, you can get hurt, but the flows that I've seen, they're predictable. [3:20] Narrator: Even when a volcano is not erupting fire and brimstone, lava tubes deep underground burble and flow. The Infrasound Laboratory of the University of Hawaii records the sounds of this activity from volcanoes like Kilauea. They speed up and magnify the low-frequency recordings so we can hear them. Volcanoes are like pressure valves for the intense heat inside a planet. Sue says this heat partly comes from radioactive elements deep underground. [3:53] Sue Smrekar: The radiogenic elements – uranium, thorium, potassium – that lose heat as they decay to other elements over time. The bulk of planet's energy actually comes from these radiogenic elements. They're bound up in the bits of rock. All rocky bodies have plenty of these elements. But it's really these radiogenic elements that are the engine of geology on any planet. [4:18] Narrator: Earth’s heat is also a remnant of our planet’s fiery birth. 4.6 billion years ago, Earth was created from the collision of gases and solids swirling around the young Sun. At first, our planet was a molten ball, and as we cooled down, Earth developed a crust. Volcanoes pocketed this fresh surface, expelling gases like carbon dioxide, water vapor, ammonia and methane. The water vapor condensed into clouds, rain, and the oceans. The cooled crust of Earth – all the mountains and valleys and land around you – makes up only one percent of the planet. If Earth was an apple, the crust would be the thin apple skin. The apple pit is the planet’s iron core, while the flesh of the apple is the hot mantle. The continents all sit on segments of the crust called tectonic plates. These plates move slowly over time, riding on convective heat currents in the mantle. When the plates move, the earth quakes, volcanoes erupt, mountains rise, and continents drift. [5:31] Sue Smrekar: Earth we know, originally it was just a single plate. Your planet cools, and you have an outer lithosphere. How did plate tectonics get started? How do we have this system of all these plates that are sliding around and creating all this deformation and all this activity on the surface of the Earth? Why is the Earth the only place to have plate tectonics? [5:47] Narrator: If planets like Earth all formed the same way, then why are all the rocky planets so different? One answer to this question could be found in how much heat they have inside. [6:05] Planets are often described as heat engines. A heat engine converts heat energy into mechanical energy, or motion. In a traditional car, for instance, when gasoline is combusted, heat from that reaction runs the engine. For a planet, the heat inside is what drives geology. It’s kind of funny to think of our planet as an enormous engine, chugging away like a cosmic car as it orbits the Sun. [6:39] Narrator: Cars like Mercury and Saturn are named after other planetary heat engines in our solar system. [6:52] Narrator: There also have been lesser-known cars named after Jupiter, Mars and even Pluto. You can think about planets and moons being like different car models. For instance, I imagine Jupiter as an enormous tricked-out Hummer, dominating all the other planets, while Mercury is more like a sleek little sports car, making one lap around the Sun in a mere 88 days. [7:17] One actual car recently entered this planetary Indy 500 race. [7:33] Narrator: Space X launched a 2008 Tesla Roadster back in February, during a test of their Falcon Heavy rocket. The convertible and its driver, a mannequin dressed in an astronaut suit and helmet, is now in orbit around the Sun. JPL has a Solar System Dynamics group that keeps tabs on the orbits of all sorts of spacecraft, including the Roadster – as well as asteroids and other cosmic objects. Astronomers expect that if the car doesn’t get torn to pieces by meteors and radiation, or crash into Mars or another planet or moon when it crosses their orbits, it could be zipping around our solar system for millions of years. Sue has been wanting to check the heat flow of Mars for a long time. [8:44] Sue Smrekar: About 25 years ago, it was one of those ideas that I had in the shower one morning like, "Heat flow, that's a super important measurement and I don't see many people working on how to do that on planets. So I'm gonna work on that. I'm gonna figure out how we might go about measuring heat flow." I started working with some engineers here at JPL to come up with a way to do that for Mars. Our approach was to send penetrators. Our idea was to drop them off a spacecraft that's in orbit, and have them hit the ground at 400 miles per hour. These were devices that actually were developed initially by the military. They actually did things like deploy seismometers to listen for troop movement – that kind of thing. And people have begun to think about how we might use them in planetary science applications. So it seemed like the right approach, because you get yourself under the ground, which is what you need to do in most bodies to measure the heat flow. We took our designs out to the Mojave Desert and rented airplanes and threw them out of the airplanes to see how they would penetrate, and how would they survive once they get to the ground. So they each had their own little aeroshell. These were tiny. The aeroshell itself was only about a foot across. It went in like its own little spacecraft. Most spacecraft pop their aeroshell off before they hit the ground. We just shattered our aeroshell at impact. And then the penetrator inside, which again, looks kind of like a nail, that would have just gone through the aeroshell and kept going into the ground. The goal would have been to send a whole network of these things to Mars, and potentially to other places. Because if you can build a dozen and send them for a relatively small price, if you lose a few, that's okay. [10:32] Narrator: Sue was part of a team that put penetrators on the Mars Polar Lander mission. The two penetrators were named Deep Space 2, but they were also known as the Mars Microprobes, and they were designed to detach from the Mars Polar Lander spacecraft just as it entered the Martian atmosphere. The penetrators presumably separated from the spacecraft, and then plunged down, hitting the surface of Mars hard enough to pierce the ground. But we’ll never know for sure, because instead of relaying data back to Earth, we never heard from them again. [11:32] Narrator: Mars Polar Lander was one of a series of Mars missions in the 1990s that didn’t make it to the planet intact – a reminder of just how dangerous going to Mars really is. [11:44] Sue Smrekar: I think we'd all been up for two days straight waiting and hoping to hear a signal come back. It was very sad. Of course it was just very devastating to have spent five years of your life working on this, and have it just stop talking to you. And so now we have a lot more information about how spacecraft go into the atmosphere. So they send back all these tones like, "Yep, did this step. Yep, did this step." It's hard to communicate a lot because they're moving so fast, and it's a short time period. But after that disaster, we have designed in much more information in case something goes wrong, we'll know what went wrong and how to fix it. So that was one of the big frustrations, too. Because we just didn't know what happened, and so we don't do things that way anymore. [13:29] Sue Smrekar: Moles, the creatures, burrow themselves under the ground, right? So, that's where the name comes from. It's really a burrowing device. [13:36] Narrator: The mole is part of a larger instrument package called HP3. That’s an acronym with one H and three P’s, and it stands for Heat flow and Physical Properties Package. It was provided by the German Space Agency. Troy Hudson is a JPL engineer who has been collaborating with the German team on HP3. [13:57] Troy Hudson: HP3 is going to go deeper than we have ever gone on any object besides Earth. The maximum depth that HP3 can achieve is five meters – that's about 16 feet – and it does this in order to get below temperature disturbances at the surface. There's daily and seasonal fluctuations in temperature, and these are essentially noise as far as we're concerned. They mask the signal of the heat coming out from the interior. So we have to dig down below that level in order to make the key measurements we need to get at the heat flow. We're very constrained on most space missions with mass and power. And so what we've done is we've traded the power of the mole strokes for time. We're not in a rush to get deep. We don't have to do it in a day, or even a week. So we can use a very powerful but low power motor to wind up that hammer against those very strong springs and release it. So bit by bit, it knocks its way into the subsurface. We go about 50 centimeters at a time, so that's a very slow and stately pace where the mole penetrates into the ground pulling behind it a scientific tether. The tether provides power and data to the mole, and also has temperature sensors, which allow it to measure one critical component of heat flow. Another critical component is thermal conductivity, and that's something the mole measures as it makes its way down. Those strokes happening about once every four seconds – it’s probably going to take around 6,000 or 8,000 of those to get to our final depth. But, of course that depends on the properties of the soil that we encounter on Mars. [16:24] Narrator: This isn’t the first time we’ve sent a drilling mission to outer space. [16:58] Sue Smrekar: The first time on another planet where we measured heat flow, it was with a drill. This was on the Moon. Apollo astronauts had a drill and they went out there and drilled holes into the Moon and put temperature sensors down below the surface. We don't have astronauts on Mars, so we have to do it in a different way. It's actually super hard to drill a very deep hole robotically. You can't take a 15-foot drill on our spacecraft to Mars. You would have to assemble it into bits once you got there. So all that stuff is tricky to do in terms of a regular drill. [17:34] Narrator: The Curiosity rover currently operating on Mars has a drill, but it can drill down to, at most, a few inches. As Troy said, the drill for InSight is meant to burrow down as far as 16 feet. [17:50] A visit to any big city makes drilling seem like a simple, if noisy, routine task. But as Sue mentioned, it’s not so easy to have a robot rather than a person operate a drill. Also, engineers had to design a drill to work on a planet with a very different environment from Earth. [19:13] Narrator: Instead of drilling its way down into the soil, the mole kept popping itself up and out. The problem turned out to be the very low air pressure of the Mars simulation tank, which didn’t damp out the recoil of the mole’s vibration. [19:27] Sue Smrekar: If you’ve ever fired a rifle or something, you know that there is a recoil. Basically, when you have that momentum going forward, there's a push back. And it's the same with our little hammering mechanism, or in a jackhammer. We discovered that our mole was not going to be able to push itself into the ground with that design. We had to modify it slightly. So basically, there are kind of like three moving parts within the hammering mechanism and they really had to adjust the distribution of mass. In the end, it ended up being a relatively small adjustment, but a really important one. [20:01] Narrator: After all that work to design what is basically a planetary thermometer, InSight will use it to take Mars’ temperature. So by measuring the heat coming out of the inside of the planet today, we can estimate just how much of that energy Mars has. And we can extrapolate backwards in time, to the very beginning of when Mars formed. And so we can have this estimate of how the amount of energy has changed over time. [21:07] Narrator: Knowing how Mars’ energy has changed over time can give us a little window into what Mars was like in the past. Bruce Banerdt, the lead scientist on the InSight mission, says the temperature measurement also could help figure out whether Mars has underground lakes of water today. For instance, InSight could help confirm a recent finding, made by the European Space Agency’s Mars Express satellite, that indicated there could be liquid water under the base of Mars’ south polar ice cap. [21:36] Bruce Banerdt: The possibility for there being liquid water at the base of the polar cap depends on what the temperature is down there. It has to be warm enough for the water to melt. What InSight should be to do is to get an idea of how much heat's flowing out of the inside of Mars, which can lead us to be able to calculate the likely temperatures at the base of the polar cap. And that would help to figure out whether it's plausible that this is liquid water. [22:04] Narrator: If Mars is warm enough underground to have liquid water, rather than frozen-solid ice, that’s not only good news for future explorers who need a source of water. It also increases the odds that Mars could have life. On Earth, water and life go hand-in-hand, and so it’s thought any other planet with liquid water also could have life. Some scientists think life on Earth originated from the interaction between volcanoes and liquid water, at volcanic vents at the bottom of the sea. Although it’s still an open question, the combination of volcanic energy, vent minerals, and water would seem to provide all the ingredients needed for life to arise. [23:00] Troy Hudson: The mole is not infallible. It can be stopped by an unfortunately sized or shaped rock in the subsurface. We are landing at a location where there are very few rocks on the surface, and we have many indications that we've got quite a distance of broken up ground, to dig through with very few rocks. Nonetheless, there is a possibility that the mole might impact a rock or some other sort of impenetrable barrier that prevents it from going further. We can still do the science, but we need to account for those disturbances that are propagating down from the surface, those annual temperature variations which affect our data. And if we impact a rock at an unfortunate depth, like some depth that's too shallow for us to use, it's unfortunate, but that's what Mars can throw at you. [23:53] Ashitey Trebi-Ollennu: We call ourselves the gravediggers on Mars. So it was an exciting mission because the lander was going to die because we only had a year, because winter was coming in, right? So it was a race against time. [24:08] Narrator: If you’d like to check on the Tesla Roadster’s location in the solar system, visit the HORIZONS web page at https://ssd.jpl.nasa.gov/horizons.cgi. We’ll also include the web address and instructions on how to use the HORIZONS interface on our web site: https://mars.nasa.gov/insight. If you like this podcast, please subscribe, rate us on your favorite podcast platform, and share us on Facebook, Instagram, and Twitter. 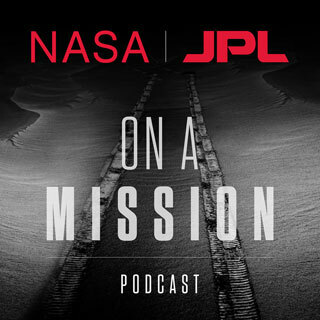 We’re “On a Mission,” a podcast of NASA’s Jet Propulsion Laboratory.